If the usual standard selection of molding and mill work isn't satisfactory to your woodworking tastes, then look for the CMT Molding System instead. With these bits, you can make dozens of elaborate profiles by combining two or more passes. Avoid the average and create your own moldings. Some initial suggestions are illustrated below. 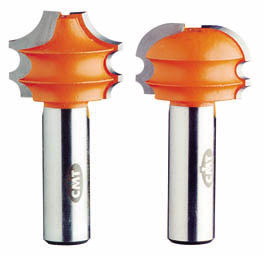 Safety tips: Use these bits with a fence. The profiles shown below are milled from heavy stock then refined to the desired shape.